A quick question. To what extent has urbanization, in your opinion, contributed to the increase in higher low temperature readings? Excellent balanced discussion as usual. If only we saw this happen in the "mainstream" (pipe dream, I know). the NOAA has TERRIBLE siting for its temperature stations. they have never even surveyed them themselves. but anthony watts and a number of volunteers armed with flir cameras did. they found that only 8% met the NOAA's own guidelines. over 70% have a warming bias exceeding 2 degrees c, which is to say, somehting like 3 times the per century trend that is being measured. no way are you going to be able to clean that signal up. this is what makes the hcn reference network so interesting. it is just their best sites. they are all well located and they do not need to be adjusted. it's a clean signal that is well spread in the CONUS. 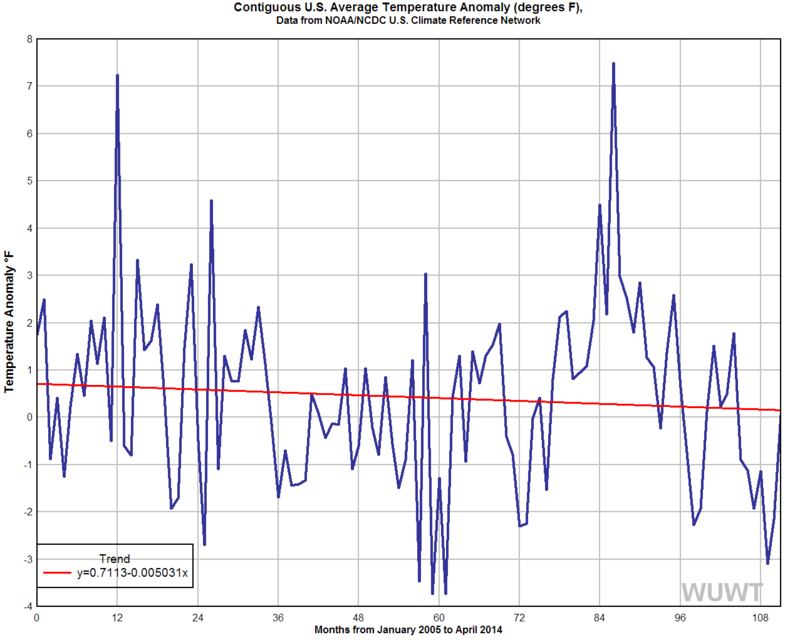 when looking at just these 114 stations, the US has cooled over the last decade. the system is only about a decade old, so the data is limited, but it really ought to give us a better yardstick going forward. i have not seen a comparison of min temp readings for the reference vs the whole hcn, but it would be an interesting thing to look at. Statistical analysis presumes one or more underlying cause and effect relations that will lend some degree of predictablity to the system. If this does not pertain then the results obtained are artifacts of the statistical method. This is the case for the Michael Moore hockey stick graph. Feeding the batting averages of players in the NL West to the method yields a graph with the same shape. The climate is non-computable, a word coined by Roger Penrose. There are reasons why this is so. It is impossible to measure the initial conditions in sufficient detail - it will always be an approximate present. 2. Many of the proposed mechanisms are theoretical and not confirmed by experiment. 3. Many of the known mechanisms are both chaotic and discontinuous. An example is water - the temperatures of the phase transitions (vapor, steam, water, ice, snow) are dependent upon other things, such as atmospheric pressure, as well as is the precise energy absorbed/released in the phase change. The futility of attempting to model the climate is evident if you note that the predictions of the 40+ most referenced models are grossly at variance with what you see outside your window. Is the climate changing? Of course. Where is it going? See your local bookie. He can at least give you the over/under. NASA did actually adjust the satellite data in 1998 because it wasn't showing any upward trend. Not showing an upward trend is obviously a mistake. Showing a downward trend is also obviously a mistake. Up can never be a mistake. The satellite data has a +0.13 per decade adjustment for orbital decay based on a RSS model. Published and implemented by RSS in 1998 and finally accepted by UHA in 2005 after a adjustment to the balloon data. UHA had argued that the adjustment was wrong because it did not match radiosonde balloon data. Overall, a very fine post: However, I take issue with this statement: "However, blaming the whole of the warming signal on such adjustments is just wrong -- satellite data bases which have no similar adjustment issues have shown warming, at least between 1979 and 1999." I take issue -- not because it is incorrect, but because it is misleading. Satellite data bases do show warming in that time frame -- I do not believe there any dispute there. But we did not have satellites back in the 50s and 30s . 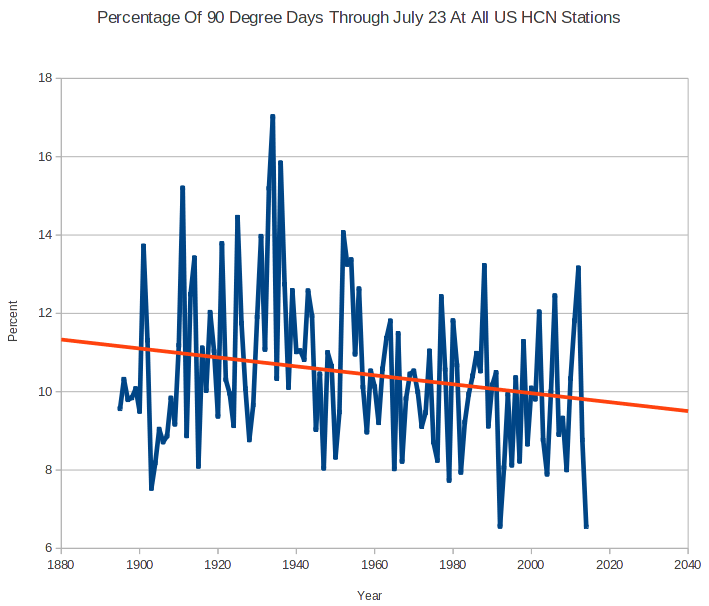 . . and the point of Mr. Goddard and others is that the data adjustments is responsible for the warming trend since the 1930s. 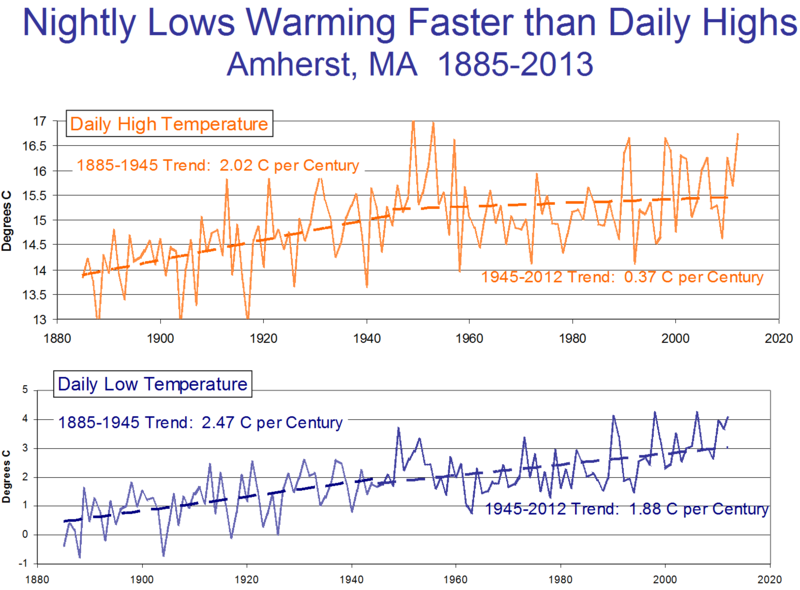 Take away the adjustments, and you have NO warming trend in the last 80 years -- or longer. I understand the inherent desire for adjustments because the measuring mediums often have not been stable, but the adjustments (over 80 years) is more than the trend. It is mistaken policy to get excited about a trend that is produced via the adjustments of self-serving analysts. Raising of the lower bounds is a benign process; raising of the upper bounds, not so much. What really needs explaining is why the adjustments are so rigourously unidirectional.